The challenge in grain sampling is to obtain a representative sample that will accurately reflect the characteristics of the whole bulk. The best opportunity to do this is during the filling of your store as this allows for regular incremental samples to be taken from each load. This forms one aggregate sample from which a final representative buyer sample can be prepared. These can then be picked up by our grain collectors and taken for analysis. The test results obtained from these samples will better represent the bulk than those obtained by spearing heaps. This means you will have a better understanding of the variability of your grain, which will aid you in making your marketing decisions and help ensure that your grain meets contract specifications. Sample bags should be filled to the top, the air expelled and sealed tightly. Other information - anything releavtn, esepcially from a food safety perspective. Keep concise. LOCATION IN STORE - the location of the sample within the bulk. 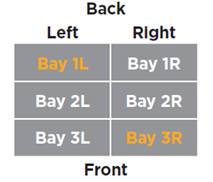 Bay 3 right should be labelled on the sample bag as:Elm Fm/Black Barn/3R. 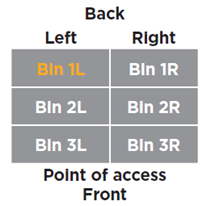 If bins are not numbered - number from the back towards the point of entry and/or from left to right. Please see examples below.